What Are These Blue Splotches on Mars? Satellite imagery from the Red Planet reveals an unexpected topographical feature: seemingly blue pools of blue liquid, situated defiantly in stark contrast to the dusty red surface of Mars. However, all is not as it seems. 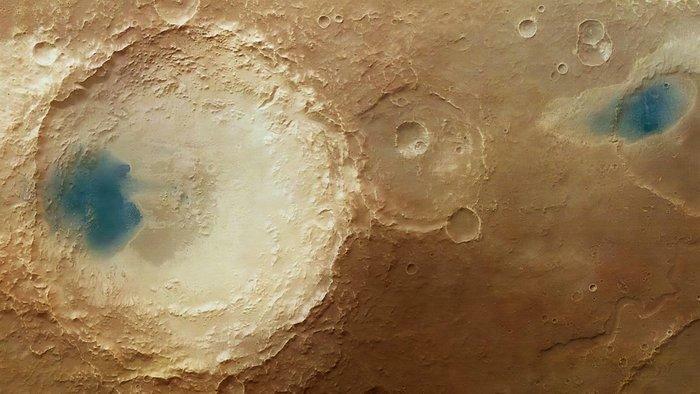 According to astronomers from the European Space Agency, whose Mars Express orbiter captured the photograph, the blue splotches are nothing out of the ordinary. The patches depict basalt-rich sediment buildups, blown across the planet by Mars' blustery winds. Strong winds whip dust and sand from the surface into a frenzy, moving it across the planet at high speeds. These winds can hit 100 km/h, enough to create giant dust storms that settle across huge swathes of Mars, lasting for many days or even weeks. As these winds travel they carve their surroundings, eroding and smoothing and gradually wearing away the planet's surface features over millions of years. Trying to keep up with the conversation surrounding Mars? Here are 10 quick facts you should know in order to sound smarter!